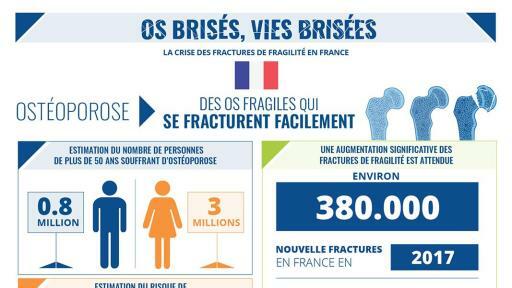 Geneva, Switzerland, (October 19, 2018) -- Released today by the International Osteoporosis Foundation (IOF), a new report looking at the burden and management of fragility fractures in six European countries (France, Germany, Italy, Spain, Sweden, United Kingdom), has highlighted the hidden, but very real, burden of fragility fractures – with the estimated associated cost at €37.5 billion per year threatening to cripple European healthcare systems by stealth. 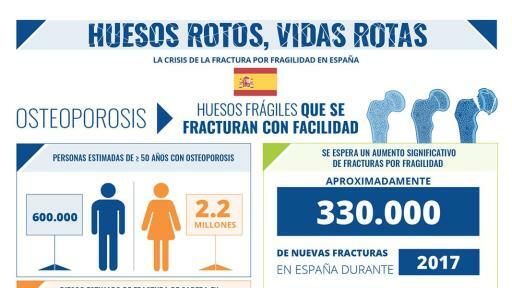 As the European population ages, the prevalence of chronic conditions, such as osteoporosis, is also set to rise, leading to an exponential rise in the prevalence of fragility fractures. 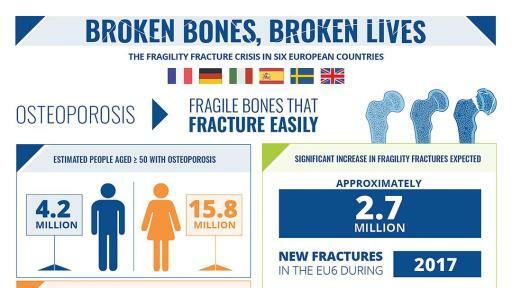 Every year 2.7 million fragility fractures occur across these six EU nations. This number is expected to increase by a further 23 per cent by 2030, with the associated cost impact escalating further, estimated to hit €47 billion in the same time period. The burden of fragility fractures exceeds those of many other chronic diseases such as chronic obstructive pulmonary disease [COPD], rheumatoid arthritis, and hypertension. 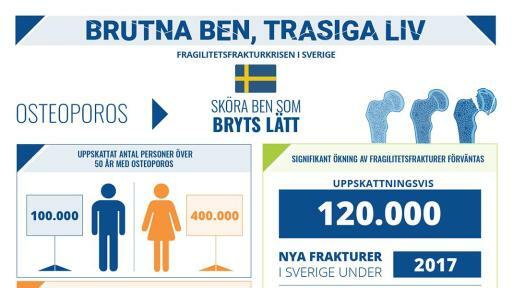 The report, “Broken bones, broken lives: A roadmap to solve the fragility fracture crisis in Europe”, provides evidence that despite the availability of effective preventative therapies and management approaches for fragility fractures, 73 per cent of women and 63 per cent of men over 50 years of age with osteoporosis do not receive adequate management or treatment. After a fragility fracture, patients are five times more likely to experience a second fracture within the next two years, yet still the majority of patients do not receive treatment that could prevent the next fracture. The social and economic impacts of fragility fractures highlight the need and urgency to implement best in class models of care. Models such as Orthogeriatric Services and Fracture Liaison Services have shown to deliver improved patient outcomes and cost saving treatments in an effective manner, in countries such as Australia, Canada, New Zealand, Singapore, Sweden, UK and the United States. 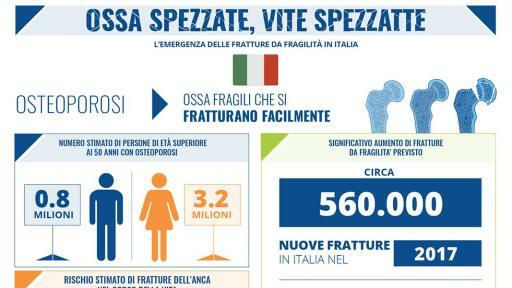 With appropriate medical treatment, many fragility fractures can be avoided. Policy makers play a crucial role in funding diagnostic services and cost-effective interventions such as pharmacological treatment, falls prevention programs and coordinated care models, as well as enforcing necessary standards for healthcare professionals and institutions. Alongside the European report, detailed country reports are available for France, Germany, Italy, Spain, Sweden, and the UK. Osteoporosis is a condition where bones weaken at a faster rate than normal; making them fragile and more likely to break. Even the slightest bump or fall can result in a broken bone (known as a ‘fragility fracture’). After experiencing the first fracture, the likelihood of incurring another greatly increases. 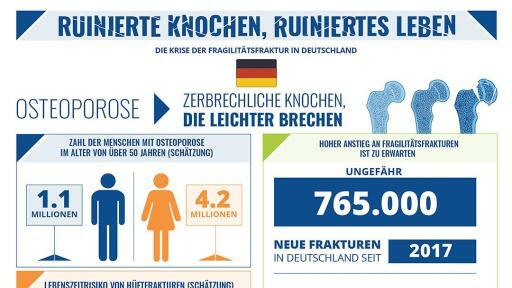 Worldwide, 1 in 3 women and 1 in 5 men over the age of 50 will fracture due to osteoporosis. Alongside the referenced European report, detailed country reports are available for France, Germany, Italy, Spain, Sweden, and the UK. See country-specific releases: France, Germany, Italy, Spain, Sweden, UK.